If the new Dyson Lightcycle table lamp and standing lamp are a bit out of a budget, you might be interested in the new ToQi Base table lamp priced at $59. 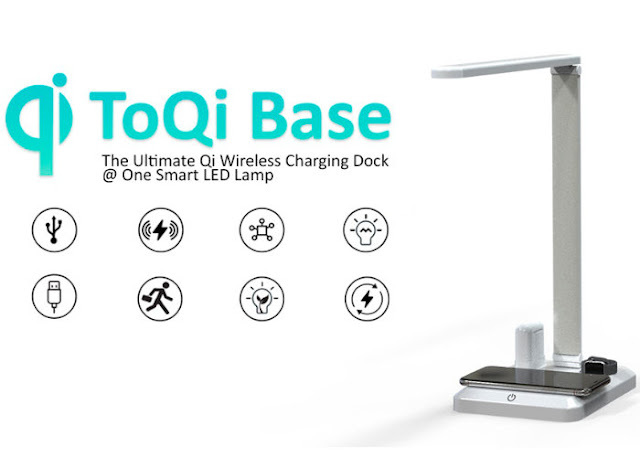 Equipped with wireless charging technology in the base and a smart LED light, Qi has wireless charging and lamp this week launched via Kickstarter with the aim of raising the necessary funds to make the jump in production. The features, construction and design of the wireless charging station that can be charged simultaneously with your smartphone, Apple AirPods and Apple Watch. "ToQi Base - pronounced ToCHEE Base - was made to make life easier with a smart design. While most of us live with multiple devices and their chargers every day, why not organize them into one power plant at the desk lamp. From the iPhone, Apple Watch or AirPods, this powerful multi-tasking wizard was born for you. It is also compatible with Qi-enabled Android smartphones and has an extra USB port to connect charging cables to everyone. " "ToQi Base is foldable and easy to fit in bags and backpacks, making it super easy to travel from home to office. It is the perfect smart organizer on the desktop for a minimal and integrated lifestyle. ToQi Base uses the features and presence of Our daily electronics with a smart design, the ultimate drive to keep all your devices ready and ready at all times, the ToQi Base can take up to five devices at a time, and the extra USB port on the back lets you enjoy charging on the old one the school. " For more details and full specifications click the below link. So what are your thoughts on this gadget? Comment down below!